Born in Jamestown, North Dakota, Simonds studied at Michigan State University and earned a Master of Landscape Architecture degree from Harvard’s Graduate School of Design. In 1939, he opened a practice in Pittsburgh, Pennsylvania with his brother Philip and later partnered with Lester Collins. In 1970, Collins, Simonds and Simonds became Environmental Planning and Design. A committed modernist, Simonds’ noteworthy Pittsburgh projects include Mellon Square, The Equitable Plaza, the Pittsburgh Aviary-Conservatory, and the redesign of Allegheny Commons. He developed the master plan for the new Chicago Botanic Garden and was engaged in the large-scale planning and development of new ecologically planned communities in south Florida including: Miami Lakes, Saga Bay, Indian Trace, and Pelican Bay. He was a dedicated environmentalist, professor, and an academic writer of numerous texts including the classic Landscape Architecture: A Manual of Site Planning and Design. Respected in the profession, Simonds was awarded Fellow of the American Society of Landscape Architecture (ASLA); the ASLA medal; and the ASLA President's Centennial medal. John Simonds was born in Jamestown, North Dakota, in 1913. He was the second of five children born to Guy Wallace and Margueritte Simonds. His father, a Presbyterian minister, moved the family to rural Michigan when Simonds was young. Influenced by his father's love of the outdoor life, he developed a sense of adventure, and curiosity, which lead him to value the natural world all his life. John Simonds studied landscape architecture at Michigan State University. He graduated in 1935, and continued his landscape education at Harvard, earning a Masters Degree in Landscape Architecture in 1938. He was a student at Harvard during a pivotal time in which Garrett Eckbo, James Rose and Dan Kiley led the "Harvard Revolution", a student revolt against the traditional teachings of the Beaux Arts style. The arrival of Walter Gropius, former head of the Bauhaus in Europe, at Harvard University in 1937 had a profound effect on the future of architecture and landscape architecture in the United States. Espousing a break with the past, Gropius promoted a modernist movement that revolutionized architecture and landscape design. In landscape it took its inspiration from modern art and natural forms; it was expressed with new shapes, materials, and spatial relationships. Simonds looked toward this new philosophy for his design inspiration. These modernist ideas would appear in Simonds' projects throughout his career and are exemplified in his designs for Pittsburgh 's Mellon Square, The Equitable Plaza, and Allegheny Commons. In 1939, after his Harvard graduation, he moved to Pittsburgh, where he opened a landscape architecture practice, Simonds and Simonds, with his brother Philip Simonds, who also was a landscape architect. Over the years their firm grew from a small residential practice to a successful multidisciplinary landscape architectural and planning firm with offices in Pittsburgh, Washington DC, and Miami Lakes, FL, (Collins, Simonds and Simonds, 1952-1970), and EPD, (Environmental Planning and Design Partnership, 1970- to the present). 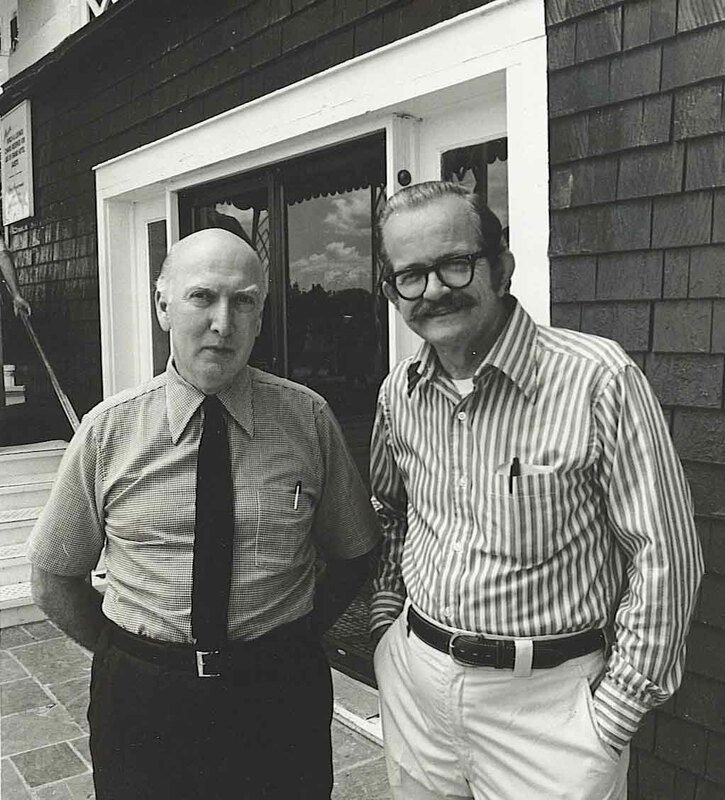 In 1978 Simonds became partner emeritus. John Simonds met and married Pittsburgher Marjorie Todd, in 1939. They had four children, whom they raised in Ben Avon Heights. Marjorie was his life long friend and companion. She became a valued editor of his textbooks, several of which are dedicated to her. Simonds loved to travel; he and Marjorie made many trips together. As a young man he traveled around the world twice, in 1933 and 1939. He studied and experienced the iconic examples of civic architecture and landscape design. His trips to Europe, the Orient, and Latin America continued to contribute to his own evolving design ideas all his life. He believed that travel was vital to growth and to the understanding of design. At his own firm he encouraged his staff to travel and made it possible for them to have the time to do so. Simonds and Simonds received many important commissions, which reshaped Pittsburgh 's downtown and suburbs. At the end of World War II, Pittsburgh was the headquarters for many large national corporations. To inspire a new future for Pittsburgh, Pittsburgh 's Regional Planning Association directed its efforts to rebuild significant areas of downtown Pittsburgh. This initiative, known as the Pittsburgh Renaissance, was responsible for revitalizing downtown Pittsburgh from an industrial work place to a modern city with new corporate buildings, plazas, and parks. These new spaces were created to showcase a city of the future, with the use of modernist forms and materials. 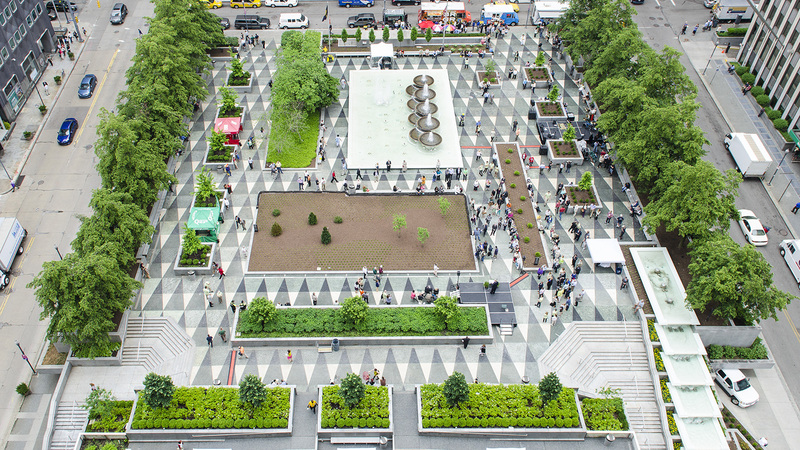 John Simonds designed two of the major public spaces of this era, Mellon Square and The Equitable Life Insurance Plaza. Mellon Square, built in1955, was the first Modern garden plaza built over a parking garage and the second park built over a garage in the United States (Union Square, in San Francisco opened in 1942). 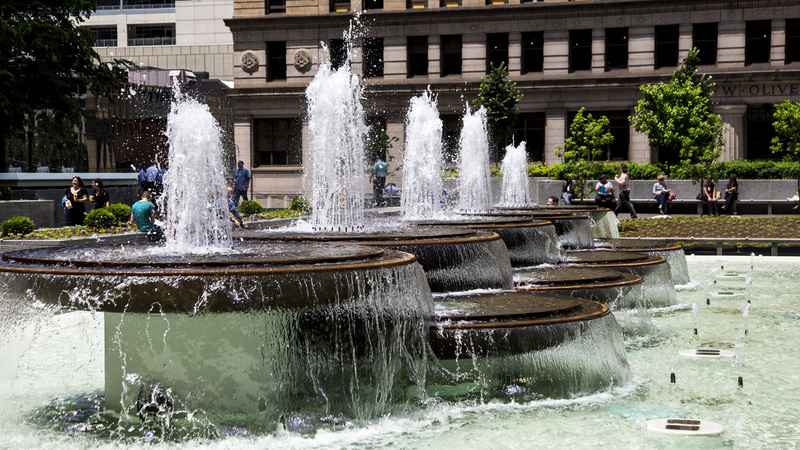 Reminiscent of the grand plazas of European cities, Mellon Square was intended by Simonds to be an oasis, a civic monument, and a gathering space in the midst of downtown office towers. 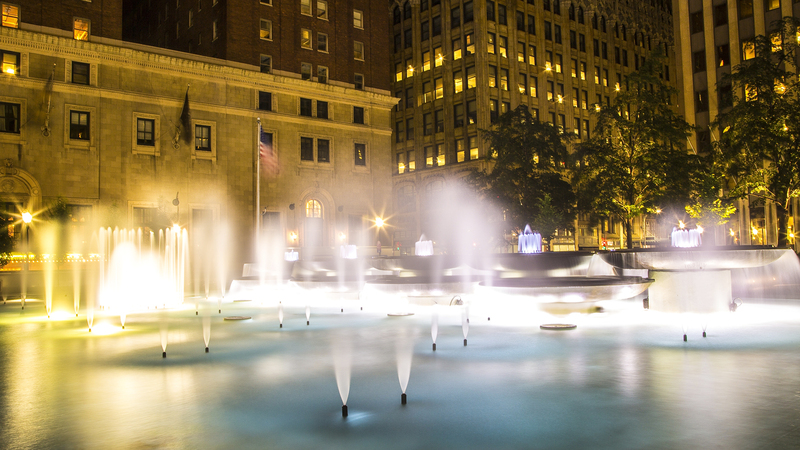 Its well-conceived plan and modernist design has provided Pittsburgh with a downtown civic space, which has remained popular and active for over 50 years. Lester Collins partnered with John and Philip Simonds; their firm Collins, Simonds and Simonds was active from 1952 to 1970. In 1955, they designed another important Pittsburgh public space, The Equitable Plaza, part of The Gateway Center Development, (Clarke & Rapuano), at Pittsburgh's Golden Triangle. Like Mellon Square, it also was built over a parking garage. This Modernist plaza created a vibrant and active public space to compliment the adjacent modern office buildings. The design included irregular shaped planting beds, animated fountains, and a tri color-paving pattern. This group of isolated buildings set within a dense landscape was, and remains Pittsburgh 's best example of International Style planning. Also in the 1950s John Simonds worked with Architect Lamont Button and the Director of the Pittsburgh Department of Parks and Recreation, Howard B. Stewart, to design the grounds and interior exhibit space for a radically new kind of aviary and plant conservatory in West Park. The Pittsburgh Aviary-Conservatory was conceived to showcase tropical birds and plants in spaces that replicated the bird's native habitat. The most popular exhibits were the rooms where the birds were permitted to fly amongst the visitors and the vegetation. Simonds and his firm designed the rockwork, streams, pools, paving, fountains, and furnishings to compliment the tropical environment. 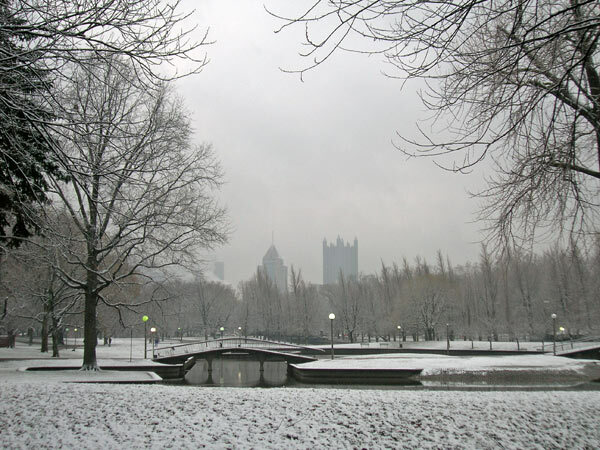 Pittsburgh, located in Allegheny County, like other municipalities around the country wanted to provide a network of public recreational opportunities. 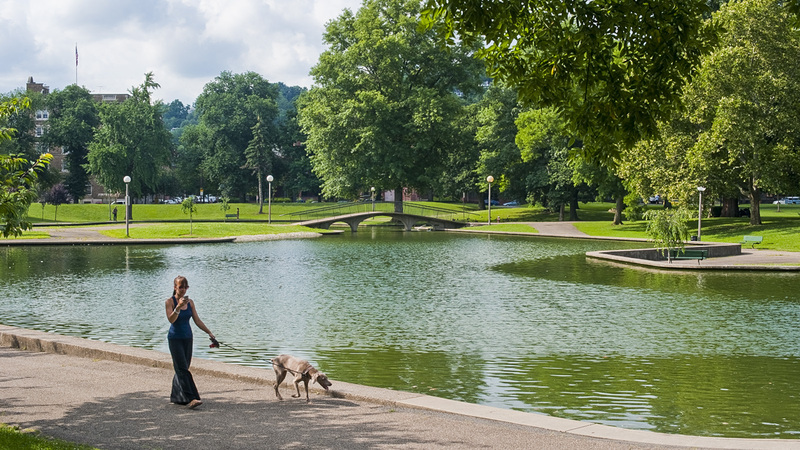 Simonds and Simonds participated in developing a Regional Park System for Allegheny County. 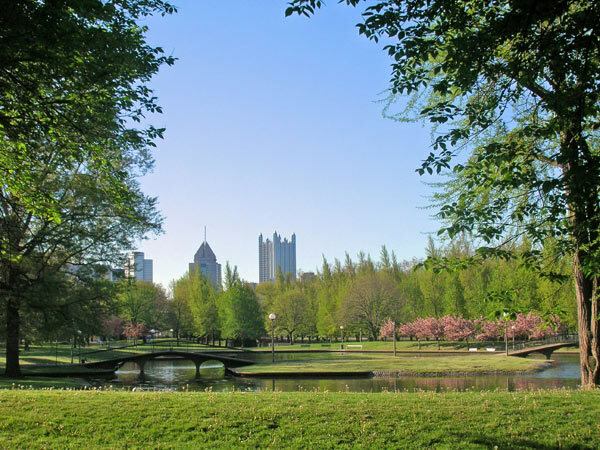 Beginning in 1958, three Pittsburgh firms, Simonds and Simonds, Griswold, Winters and Swain, (later GWSM) and Ezra C. Stiles, worked with Park Director George E. Kelly, to design a system of six new regional parks which ringed Pittsburgh. These regional parks provided a well distributed system of public green spaces which emphasized family recreation, low maintenance, simple shelters, good roads, ample parking, and maximized the natural features of each site. 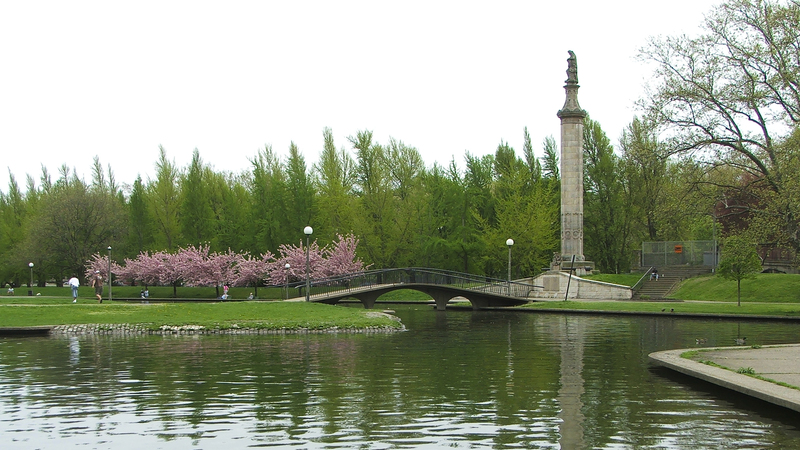 Another Pittsburgh project was his plan for the redesign of Allegheny Commons, the oldest park in Pittsburgh. The park was originally designed by William H. Grant, of Mitchell Grant & Co, New York City in 1867; it was redesigned beginning in the late 1930s by Ralph Griswold. The 1966 rehabilitation project was part of an effort to reclaim a historic park that had become unsafe and had fallen into disrepair. Here Simonds' respect for the history of a site, and his sensitivity to the work of others whose designs preceded his, combined with a consideration for contemporary needs, resulted in a preservation of the earlier picturesque design and a sympathetic integration of new modern materials, forms and features, including a trapezoidal lake that took advantage of the parks historic visual and spatial relationships. Beginning in the 1960s, Simonds' work began to branch out from Pittsburgh. 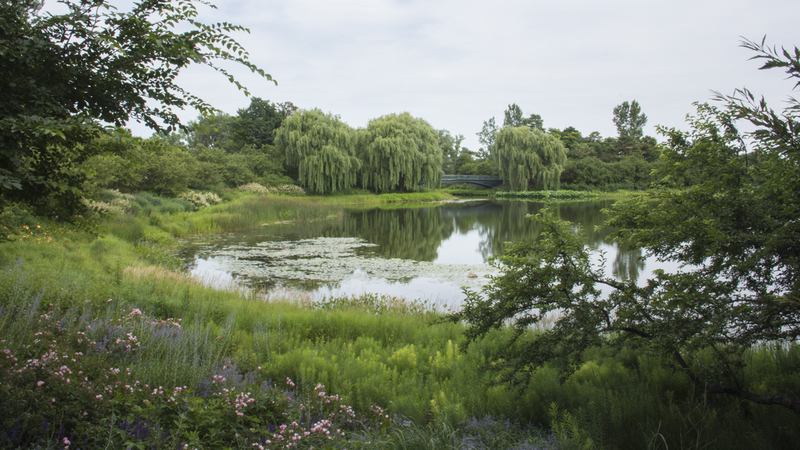 At this time he developed the master plan for a new Botanic Garden for the Chicago Horticultural Society. The success of this master plan began a series of commissions for EPD, which shaped the designs of future botanic gardens around the country, and which became a significant specialty of the firm's work. The site was an abandoned farm and polluted borrow pit in Glencoe, Illinois. EPD created a series of gardens by shaping and mounding the farmland and creating lagoons and islands in the borrow pit. 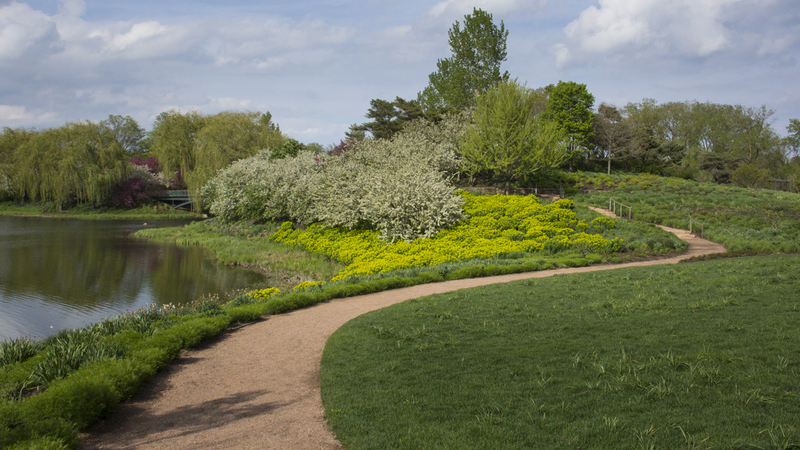 Inspired by the Garden of Perfect Brightness outside Beijing, the garden paths meander and create a range of garden spaces and views reminiscent of a pleasure garden. This design shifted the focus from the conventional style of research gardens, to a garden designed for public education with lecture space; demonstration exhibits, and narrated tram rides. In the 1970s large-scale planning became the focus of much of Simonds' work. During this time Simonds was able to apply his ideas for community planning in the development of many new communities in south Florida. The communities of Miami Lakes, Saga Bay, Indian Trace, and Pelican Bay were among scores of planned communities which were designed by EPD in the 1970s and 1980s. The award-winning Pelican Bay community outside Naples, Florida, is an example of Simonds' master planned communities. These new town plans followed planning concepts developed over years of community-based work, and the design tradition of the new American towns such as Radburn, New Jersey, designed by Henry Wright and Clarence Stein in 1928. The emergence of environmental and systems approach to design made popular by Ian McHarg's book Design with Nature, also influenced the development of the south Florida new towns. Realized over many years by corporate development companies, these new communities succeeded because of a strong economic foundation, an interest in preserving the site's unique natural systems, and a master plan that was flexible and met the needs of the individual and the community. These communities were designed to blend with the environment, not dominate it. They were successful because they offered cluster housing of various sizes, a hierarchy of different types of transportation routes, created recreational opportunities, parks, pools, and golf courses within the community, and provided protection for the sites' natural resources. In addition to his private practice, Simonds consulted to the Federal government, including the Department of Housing and Urban Development, the US Department of Transportation, The National Park Service, and the Corps of Engineers. He also served on the President's Task Force on Resources and the Environment, 1968-1970, Board of Urban Advisors, Federal Highway Administration 1966-68, and was a member on the Design Advisory Panel, Operation Breakthrough, U.S. Department of Housing and Urban Development, 1970-1974. Complementing his professional practice Simonds' career included a mixture of academic writing, teaching, and publishing. 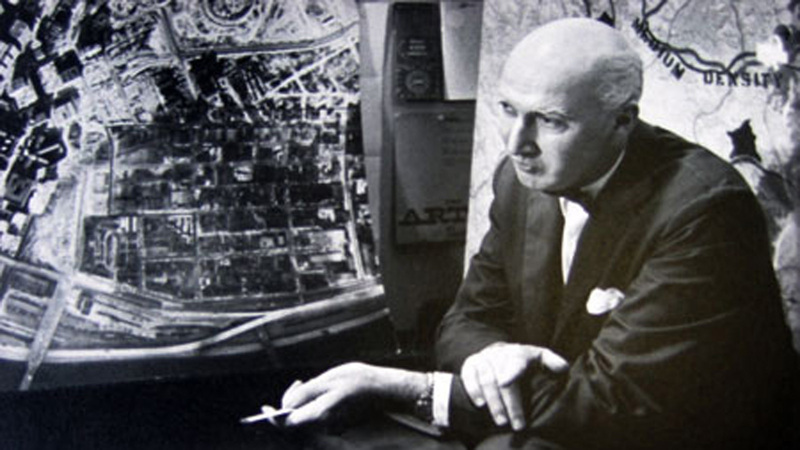 He taught courses in planning in the Architecture Department, at Carnegie Mellon University for 15 years from 1955 to 1962. He also lectured at other universities around the country including Cornell, Yale, and the University of California. In addition to teaching, his commitment to the profession led him to be an insightful author of numerous textbooks and articles on landscape architecture. His interest and ability to express the primary concepts of the landscape planning process to students were the basis for his books on landscape, urban and environmental planning. The books are richly illustrated with case studies and ideas gleaned from years of practice. His book, Landscape Architecture: A Manual of Site Planning and Design first published in 1961 and reprinted 1983 and 1998 is considered a classic text. An avid environmentalist and planner, he also authored Landscape Architecture; the Shaping of Man's Natural Environment, 1961, Earthscape: a Manual of Environmental Planning, 1978, and Garden Cities 21: creating a livable urban Environment, 1994. As a member of the Federal Highway Administration, Board of Urban Advisors in 1966- 68, he was the editor of the seminal Federal Highway publication, Freeway in the City. Principals of Planning Design by the Urban Advisors to the Federal Highway Administration. Winner of numerous awards and honors both academic and professional he demonstrated the professional leadership few could claim. Among his many honors he was elected a Fellow of the American Society of Landscape Architecture in 1965; he was honored with the American Society of Landscape Architects medal in 1973; and awarded the ASLA President's Centennial medal in 1999. He was made a Fellow of the Royal Academy of Design, Great Britain, in 1970. A dedicated environmentalist, John Simonds often wrote about the need for landscape and urban planning to better consider man's physical and spiritual connection to nature. In Landscape Architecture Simonds wrote, "It is fundamental to intelligent land and resource planning that the natural systems which protect our health and well being be understood and sustained." John Simonds was committed to quality, to clients needs, and to a belief that one's work should instill pride and enjoyment. He wanted to leave the world a better place than he found it, and he did so by encouraging excellence and mentoring those who worked for him, by educating students with popular textbooks, and by designing public spaces that still thrive a half-century later. Still active in retirement, he was consulted in the early1990s on the restoration work on his 1950s design for Mellon Square. John Simonds died in May, 2005 in Pittsburgh, Pennsylvania, at 92. Simonds, John Ormsbee, Landscape Architecture: A Manual of Site Planning and Design, McGraw-Hill Professional;(1961). Revised and reprinted in collaboration with Barry Stark(2006). Insight to the principals of landscape architecture and design. Earthscape: a Manual of Environmental Planning, New York: McGraw-Hill, 1978). Environmental and regional planning concepts. Garden Cities 21: Creating a Liveable Urban Environment. New York: McGraw Hill (1994). Simonds looks at an organic approach to designing cities. 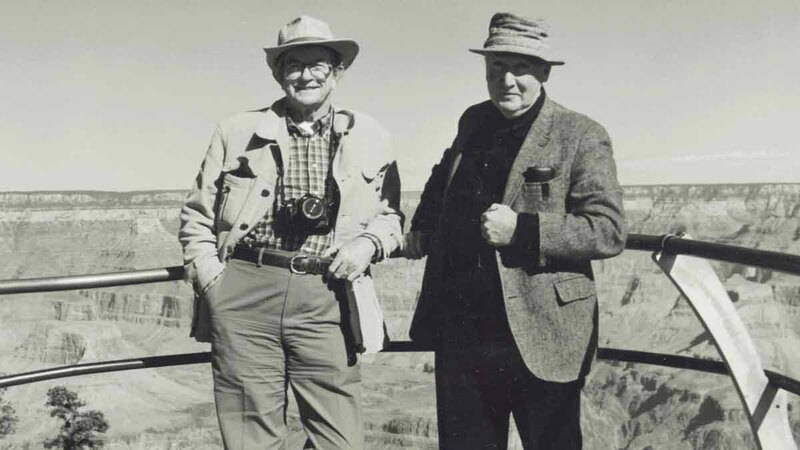 The extensive John Ormsbee Simonds Collection, at the George A. Smathers Library, University of Florida, Gainsville, includes drawings, project files, and plans, correspondence, and speeches.